he TS-673 features two PCIe (Gen3 x4) slots, allowing for installing single/dual-port 10GbE NICs to accelerate applications that demand higher bandwidth such as virtualization, media workflows, and backup/restoration tasks for an ever-growing amount of data; or a USB 3.1 Gen2 (10Gb/s) expansion card for transferring large media files to and from USB storage. You can also install QM2 cards, wireless network cards or an entry-level graphics card to extend NAS functionality. The TS-673 supports the innovative QM2 PCIe card that allows for adding up to two M.2 SSDs. You can configure SSD caching, or create a RAID 5 tiered storage along with the two M.2 SSDs in the NAS*. As these M.2 SSDs will not occupy any 3.5-inch drive bays, the QM2 card allows you to maximize both your storage capacity and performance. There are also QM2 cards that include 10GbE 10GBASE-T connectivity to provide SSD caching with high-speed network connectivity on a single card. The TS-673 features SSD caching, and also supports optional M.2 SATA 6Gb/s SSDs (sold separately). Using an SSD cache boosts overall system performance, and is perfect for improving the overall workflow of random IOPS demanding applications such as virtualization. QNAP’s Qtier™ technology also continuously optimizes storage efficiency by tiering files and data across M.2 SSD, 2.5-inch SSD, and high-capacity SATA drives based on access frequency. The new Qtier™ 2.0 features IO-awareness that empowers SSD-tiered storage with a cache-like reserved space to handle burst I/O in real time, greatly maximizing the advantages of SSD. The TS-673 allows for installing a low-power graphics card (powered solely by the PCIe slot) to boost system performance. With a graphics card installed, the TS-673 also enables smoother video editing workflows and supports 4K UHD transcoding to deliver an exceptional multimedia experience. You can also use the QNAP remote control (sold separately) or the Qremote mobile app to use the NAS as a home theater PC. Install a compatible PCIe wireless network card (for example: QNAP QWA-AC2600) on the TS-673 and use with the WirelessAP Station app to use your NAS as a convenient wireless base station. Your mobile devices and PCs can directly connect to your NAS for easy access to its services and Internet connection. The TS-673 centrally stores data and various files, and supports SMB/CIFS, AFP and NFS protocols for file sharing across Windows®, Mac®, Linux®/UNIX® networks. Coupled with Qsync - a utility that turns a QNAP NAS into a safe, high-capacity data center for file synchronization - any file uploaded to the TS-673 will be made available for all linked devices, such as computers, laptops and mobile devices. You can sync shared folders and team folders for group file sharing, greatly enhancing the flexibility of team projects and collaboration. Files can be centrally managed using File Station, including files from mobile devices and optical disc drives. File Station also allows you to mount a remote NAS, and transfer files between your NAS and public cloud services for greater convenience. NAP provides flexible backup and disaster recovery solutions to assist organizations in routine backup jobs with greater cost-efficiency and productivity. QNAP’s new QVR Pro surveillance solution allows you to arrange a dedicated, independent storage space for surveillance data on TS-673 and leverage the advantages of scalability and storage manageability from QTS. With QVR Pro, camera management, storage space allocation, camera live viewing and playback is greatly simplified. You can also use the QVR Pro Client mobile app to monitor your cameras from anywhere, or use a USB webcam as an ONVIF network camera with the QUSBCam2 app. 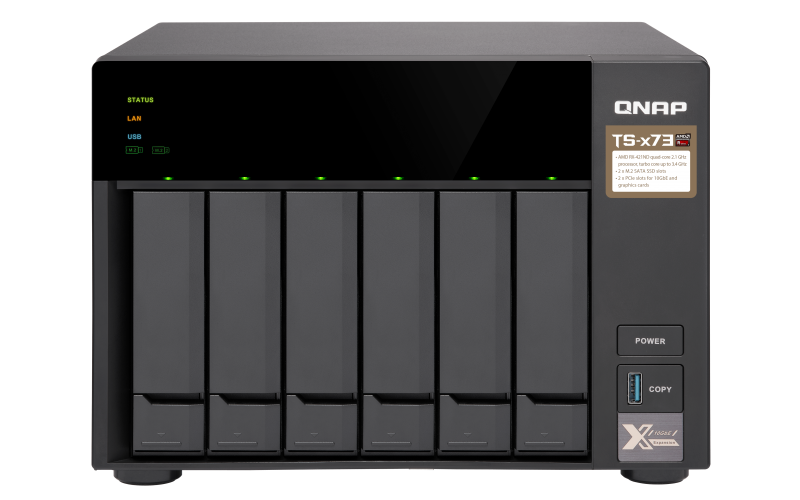 Download the QNAP TS-673 4G Specifications (PDF). Download the QNAP TS-673 8G Specifications (PDF).